In 1961, a plane carrying hydrogen bombs broke apart over North Carolina. And then the failsafes started failing. The date was January 23, 1961. Three days earlier, John Kennedy had been sworn in as the thirty-fifth president of the United States. Americans on the East Coast were going about their days not realizing that they had come close -- shockingly, seriously, terrifyingly close -- they would come to being the victims of a nuclear explosion the likes of which the world had never witnessed. The most shocking and serious and terrifying thing? Had it happened, it would have been an accident -- friendly fire of the worst and most destructive kind. It went like this, The Guardian reports. An American B-52 bomber had taken off that late-January day from the Seymour Johnson Air Force base in Goldsboro, North Carolina. It was to be a routine flight along the Atlantic seaboard: a 24-hour "Coverall" airborne alert mission. All was going normally when the aircraft developed a leak in its right wing during a refueling rendezvous. The plane, suddenly, went into a tailspin. The problem -- the problem even bigger than the fact that a human-crewed plane was spinning toward the earth -- was the plane's payload. The bomber was carrying what its name suggested it would: bombs. Hydrogen bombs, in this case -- Mark 39s. The plummeting plane had a payload of four megatons – the equivalent of 4 million tons of TNT -- and each bomb was capable of delivering a force that would be 260 times more deadly than the ones that leveled Hiroshima and Nagasaki 17 years before. The plane spun, then broke up in the air. The five crew members ejected. The bombs the plane was carrying were suddenly flying on their own. They were, at that point, plummeting to the ground with no plane to guide them. To recap: two hydrogen bombs, detached from their vehicle, heading toward North Carolina. There were, of course, failsafes. These bombs, both despite and because of their destructive capacities, were designed for this very eventuality: Built into each were four safety mechanisms meant to prevent accidental detonation. The bombs were also attached to parachutes. One of the bombs fell onto a tobacco field near Faro, North Carolina, its parachute, ultimately, tangled in the branches of a tree. The other one fell onto a meadow, the impact burying it into the ground. Neither, obviously and fortunately, exploded. What's remarkable, though, is how close one of them did come to exploding. According to Parker Jones, a senior engineer at the Sandia National Laboratories and one of the men responsible for the mechanical safety of nuclear weapons, "One simple, dynamo-technology, low voltage switch stood between the United States and a major catastrophe." 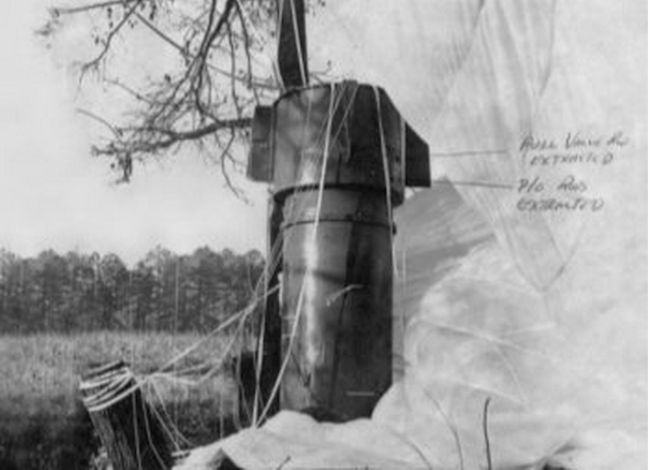 Writing in 1969, eight years after the accident, Jones found that the bombs that dropped over North Carolina were inadequate in their safety controls. While one bomb's failsafes worked as they were supposed to, the other's -- the Faro bomb -- didn't. On that bomb, as its trigger mechanisms engaged, one switch failed. Then another. Then another. The only switch that ended up working, according to Jones's report, was the final of the four. One tiny little switch standing between what we know and what could have been. "The final switch that prevented disaster," The Guardian notes, "could easily have been shorted by an electrical jolt, leading to a nuclear burst." Or, as Jones put it, understatedly: "It would have been bad news – in spades." Jones's report, obtained by the journalist Eric Schlosser through a FOIA request as research for his new book on the nuclear arms race, has been published by The Guardian. And it reveals just how close we came to being the victims of our own technological ingenuity. Schlosser uncovered more than 700 -- 700! -- "significant" accidents and incidents involving 1,250 nuclear weapons. And that was between 1950 and 1968 alone. Jones's report -- and Schlosser's subsequent reporting of its existence -- conflicts with the U.S. government's longstanding message about Goldsboro and about hydrogen bombs in general: which was that they were built to prevent accidental detonation and never put American lives in jeopardy. "The US government has consistently tried to withhold information from the American people in order to prevent questions being asked about our nuclear weapons policy," Schlosser told The Guardian. "We were told there was no possibility of these weapons accidentally detonating, yet here's one that very nearly did." Had the device detonated, lethal fallout could have been deposited over Washington, Baltimore, and Philadelphia -- and could have extended as far north as New York City. The devastation, and loss of life, would have been almost unimaginable. Even during a time preoccupied with the consequences of the world's new weapons of mass destruction. Jones's report is, of course, simply one take on an incident that remains shrouded in mystery. But, at the very least, it sheds new light on old suspicions. In Eureka, North Carolina -- 12 miles from Goldsboro and 3 miles from the Faro field -- residents have placed a plaque. It reads, "NUCLEAR MISHAP." And in smaller letters, below: "Widespread disaster averted."